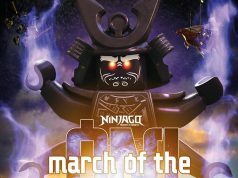 LEGO Ninjago is officially back! 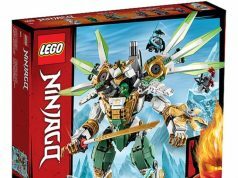 In our third straight day of reporting Ninjago 2014 news, The Brick News has posted a couple of the official images of some of the sets which came from K-Mart of all sites. There are also descriptions which lists the minifigures including General Cryptor that we first reported a couple of days ago. What’s interesting to notice here too is that that the Kai, Lloyd, and Jay all have hair pieces instead of their hooded masks although if you look closely, the hoods still cover up half their faces. Also, you can see on the top right corner of the boxes of what Zane looks like. On the back of the OverBorg Attack box, you can get a clearer picture of him in his half Nindroid form. Now we just have to wait a little longer for the rest of the sets to show up. Put the heat on General Cryptor and grab the Techno-Blade with Kai Fighter with 2 flick missiles, jet engines and speed mode wings. Escape on the Green Ninja cycle in OverBorg Attack with all-terrain tank bike, mech chair, spinning saw blades, jump ramp and 2 minifigures. Battle the Nindroids with Jay’s Thunder Raider featuring attack/speed modes, hidden flick missiles plus Cole’s Earth Mech and Techno-Blade.